"Prepare for war, but strive for peace." Valiant, courageous, a warrior without peer... but peace is his most fervent wish. Fights only out of necessity; believes all violence is ultimately pointless and counterproductive. 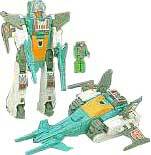 Transforms to battle station and city modes. Armed with twin laser-guided mortars on legs, heat-seeking dual laser blasters, and fusion-powered photon rifle. Has communications, detection, and repair equipment. Controls two armored vehicles, Gasket and Grommet, which combine to form Cog. Head transforms to semi-autonomous Cerebros, who is binary-bonded to the Nebulan leader, Spike. "The strongest tyrant cannot crush freedom of thought." So full of ideas that he often begins disclosing a new one before he finishes explaining an old one. Worked with the mysterious Nebulan medical doctor, Arcana, to whom he's binary-bonded, to devise new technology that created the Headmasters. In jet mode, maximum speed: 5200mph. Range: 8000 miles. In robot mode, carries high-energy photon pulse cannons. Sometimes overheats and shorts out sections of his cerebro-circuitry. "A battle plan is only as good as its programmer." Spent several thousand years crunching numbers at Cybertron's Institute for Higher Programming before a Decepticon attack reduced it to a pile of smoking microchips. Binary-bonded to Stylor, an egotistical Nebulan more concerned with personal appearance than warfare. In car mode, maximum speed: 478 mph. Range: 630 miles. Hood-mounted infra-red range finder automatically targets roof-mounted dual lasers. "War is the playground of the ignorant." To him, warfare is barbaric, worthy of only the most primitive... thinks differences need to be talked about, which he does endlessly. Uses big words no one else understands. A self-righteous snob. Binary-bonded to Gort, a cheerful, courageous young Nebulan. In helicopter mode, maximum speed: 1200mph; equipped with radioactive jammers, target-indicating radar, magnetic, infra-red, and audio sensors. In robot mode, uses 2 corrosive acid rainmaker rifles. "It's either MY way -- or NO way!" The only way to get him to follow advice is to persuade him to come up with the idea himself. Stubborn, doesn't talk much. Binary-bonded to Duros, a Nebulan who loves a battle as much as he does. In tank mode, maximum speed: 155 mph. Range: 450 miles. Has 120MM laser-guided gun that shoots incendiary, sonic and explosive shells. 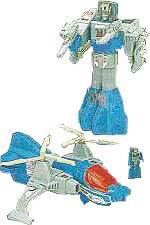 In robot mode, has 2 shatterblasters that shoot diamond-hard shards.